WEDNESDAY, Sept. 9, 2015 (HealthDay News) -- Everyone knows that high-calorie diets are tied to obesity and, too often, to type 2 diabetes. 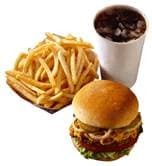 Now, a small study suggests that gorging on food can quickly tip the body into a "pre-diabetic" state. The research involved six healthy men who were either of normal weight or overweight. Increased oxidative as well as ER stress also takes place in the hypothalamus with excess calorie intake. By reducing calories, you reduce both oxidative and ER stress. This is why calorie restriction is so effective in treating diabetes as long as you are never hungry.